It will happen on Saturday, April 12, at 6pm during the 3rd Santiago Anarchist Book and Propaganda Fair, located at 330 El Lingue, near Aeropuerto and 5 de Abril in Estación Central. 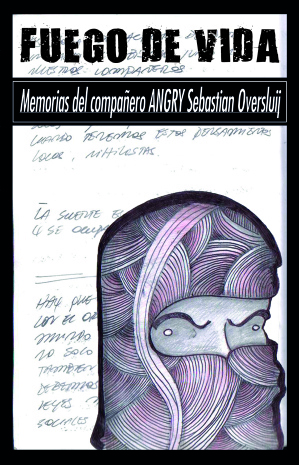 This book is a living memory that shows the thoughts, concerns and feelings of our compañero Sebastián Oversluij Seguel, better known as “Angry,” killed during an attempted expropriation on December 11, 2013 at a Pudahuel Banco Estado. With these pages, we want to make his existence live on, so that all the compañerxs and people who didn’t have the great joy of knowing him can form an idea of who ANGRY was, with his faults and his many virtues, discovering the diversity of facets of his life made war. The book is made up of some drawings the compañero made and mostly of his own writings. The transcription was done verbatim from the original texts, however you can find references or texts from other authors he selected. These words exist with his prose and diacritical faults, with minimal editorial intervention, to try not to modify his writing style in order to attempt to adequately show his unique will and beautiful enmity to all authority. This entry was posted in Publications and tagged Chile, Santiago, Sebastián Oversluij Seguel. Bookmark the permalink.